Hollybeary Creations : YNS Design Team Dare!! 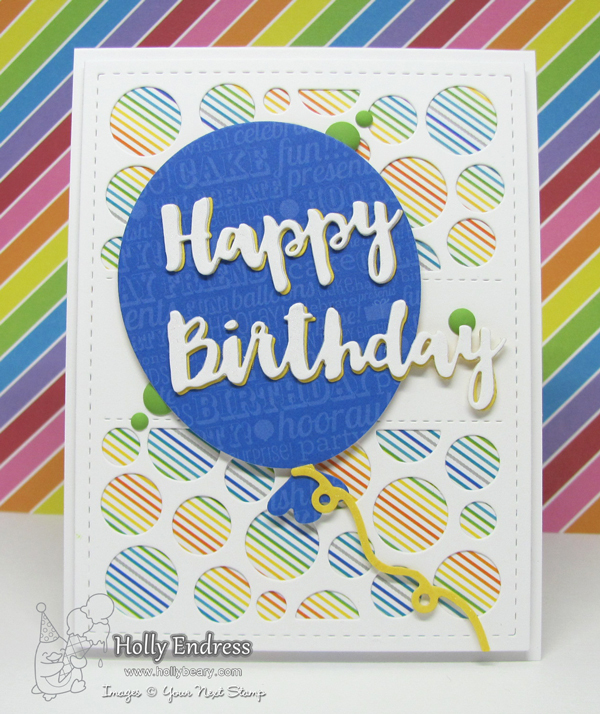 It's time for the Design Team Dare at Your Next Stamp and this month it's a "Celebration" Your Next Stamp is celebrating their 7th Birthday so we are keeping the party going all month long. And there's a chance for you to Win a set of your choice! 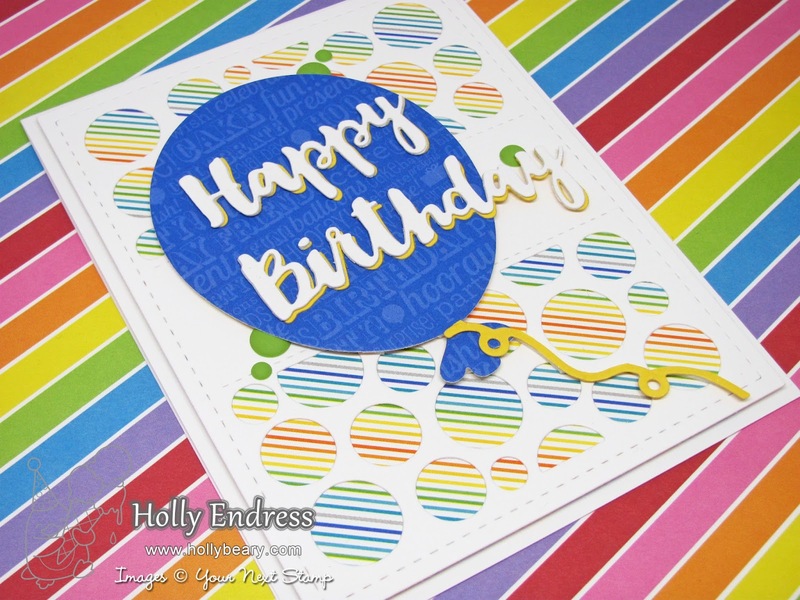 I'm using the new Scripty Happy Birthday Word die and the new Circle Panel Die. I created a top folding White card base and then I added a piece of pattern paper. I die cut the Circle Panel Die from some White card stock and added it over the Pattern paper so the stripes would show through. Then I die cut the Big Birthday Balloon from another piece of coordinating patter paper and adhered it with some foam tape. For the balloon string I die cut a piece of Yellow card stock using the Holiday Lights die and I trimmed off the bulbs. I did cut the Happy Birthday sentiment from some White card stock twice and then again from some additional Yellow card stock. I adhered the two White layers together and then I added the yellow offset a little to create a drop shadow. I added the words directly onto the balloon and for an additional pop of color I added some Spring Green Matte Gumdrops. 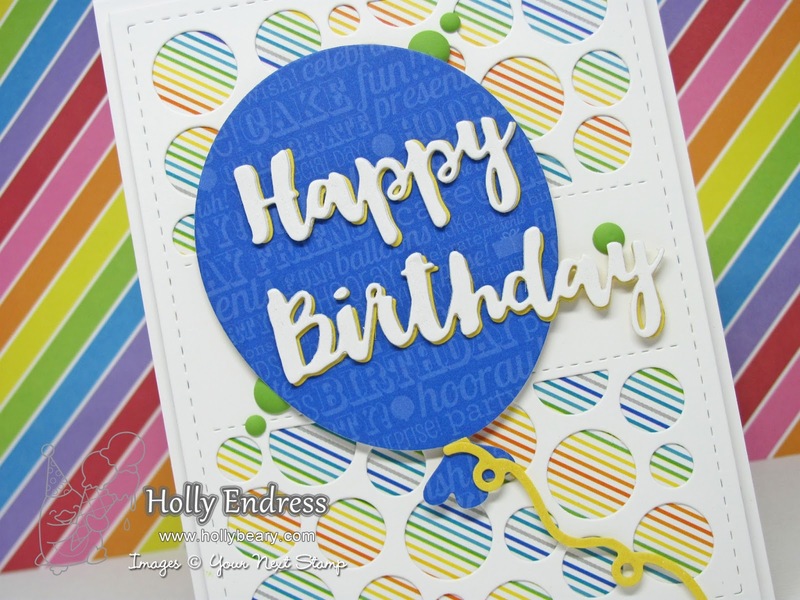 Head over to the YNS Blog for more great "Celebration" projects and leave a comment on the DT Dare post for a chance to WIN a stamp set of your choice! Love love your card Holly! Great card! I actually didn't realize the stripes came from the paper at first, I thought it was the die. That would actually make a cool die if there were stripes inside the circle .